Recently I learned that the Westminster Catechism (Presbyterian church) begins: What is the chief end of man? Man’s chief end is to glorify God, and to enjoy him forever. I spent my entire childhood attending traditional churches (though not Presbyterian), and somehow I completely missed this message. But it resonates with what I’ve learned later in life … we were created to glorify God and enJOY him. Joy is a fruit of the spirit, produced by living in relationship with God. In biblical references, dance is often a demonstration of joy. So why am I writing about this in a marriage blog? Based on these scriptures and my own experience, I believe dancing can be a source of joy for your marriage. It will require you to face your fear if dancing is something that feels threatening to you, but the pay off could be well worth stepping out of your comfort zone. 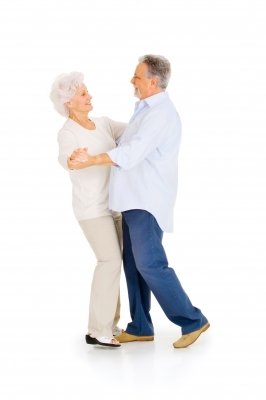 I’ve met a number of men who learned partner dancing after a failed marriage. They took a risk to try something new, and they were surprised to find they loved dancing (for a number of reasons, some of which are addressed in other posts here on this blog). Don’t wait until it’s too late to try something new that can add more joy to your marriage. Don’t shrink back from all the joy your Creator intends for you. In the previous post titled We Were Made for This, I wrote about how traditional partner dancing affirms both masculinity and femininity. Recently, I realized that the title phrase has a much broader application than simply affirming individual gender roles. That insight was a spark that ignited MarriageDance. Our Creator made us to dance. Now, you might be thinking … I don’t dance. And while dance is my “thing” and I have no doubt I was made for it, I realize that everyone out there does not feel the same way. But whether or not you physically move to music, I believe dance embodies qualities of life that our Creator intends for everyone. There’s more to dance than what you see. I recently observed a dance competition, and I could tell a difference between those who were following a set of choreographed steps and those who were truly dancing. This “more than meets the eye” quality embodies a connection with something or someone beyond ourselves. Our Creator made us for joy, adventure and a deep-rooted connection with Himself and with other people — including a notably distinct connection with a partner in marriage.